The inscription on the base of the Martyrs' Memorial reads: To the Glory of God, and in grateful commemoration of His servants, Thomas Cranmer, Nicholas Ridley, Hugh Latimer, Prelates of the Church of England, who near this spot yielded their bodies to be burned, bearing witness to the sacred truths which they had affirmed and maintained against the errors of the Church of Rome, and rejoicing that to them it was given not only to believe in Christ, but also to suffer for His sake; this monument was erected by public subscription in the year of our Lord God, MDCCCXLI. 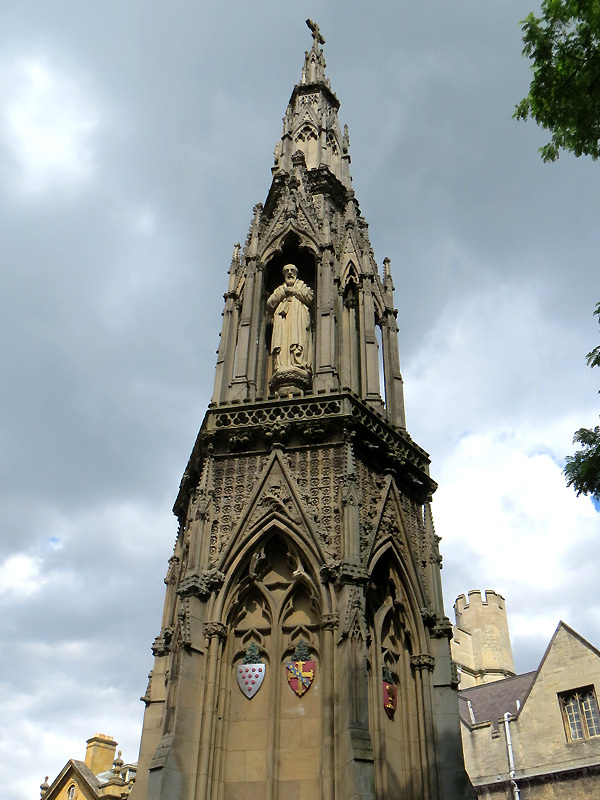 Popular rumour amongst some tour guides is that in the past students have misled foreign tourists about the nature of the Memorial and convinced them it was the spire of an underground church. This would result in the tourists venturing down a flight of stairs near the Memorial which actually lead to the public toilets.